Thiel Audio has released a new signature version of their popular CS2.4 speaker, which occupies the middle ground in their floorstanding line between the CS1.6 and CS3.7. The driver complement for the CS2.4SE is the same as the standard version. It’s a 3-way, time-and-phase accurate design that uses an 8″ aluminum diaphragm woofer augmented by a 7.5 x 11″ “race track” passive radiator, and a 1-inch dome tweeter and a 3.5-inch midrange driver in a coincident array. The CS2.4SE features a new crossover that incorporates high quality polypropylene and custom-made polystyrene capacitors for claimed improvements in precision, balance, and detail, a new hand-selected Birdseye Maple finish stained in deep red that Thiel calls “Vermilion Maple”, stainless steel hardware securing the drivers to the baffle, milled aluminum Outriggers and highly polished stabilizer spikes, and Jim Thiel’s signature on the rear of the cabinet. Production of the CS2.4SE is limited to 150 pairs, priced at $8,000. 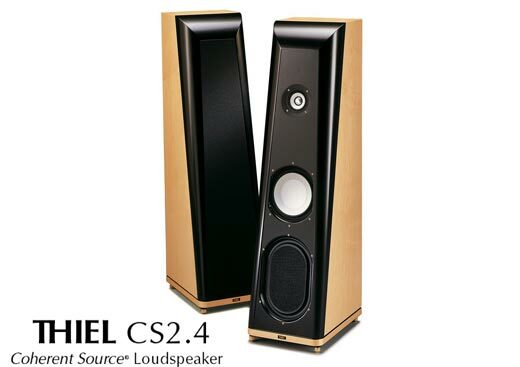 The CS2.4 is the result of THIEL’s more than 25 years of extensive experience in designing high performance loudspeakers for home music and video sound systems. Since 1977, THIEL’s innovative engineering has led to significant sonic improvements in each new model, resulting in speakers with the most outstanding performance in their class. The CS2.4 is a three-way system incorporating all THIEL-designed and built metal diaphragm drivers–a 1-inch dome tweeter, 3.5-inch midrange driver, and 8-inch woofer–along with a 7.5 x 11-inch passive radiator. Metal diaphragms provide much higher stiffness which eliminates diaphragm resonances in the operating range for very clear and open reproduction. The CS2.4 drivers also use unusual short coil/long gap, copper-stabilized motor systems to dramatically reduce distortion. Coupled with the low resonance diaphragms and very high quality electrical network components, a very high level of clarity and tonal accuracy is achieved. 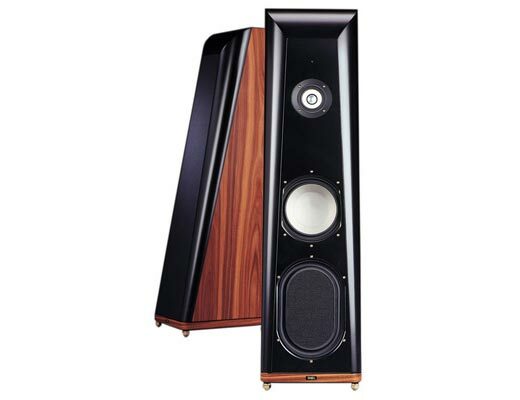 As with all THIEL loudspeakers, the CS2.4 is completely time and phase coherent for much greater sonic realism. THIEL’s Coherent Source (R) technology achieves the elimination of both time and phase distortions that cause alterations in the reproduced musical waveforms of most loudspeakers. Eliminating these distortions results in enhanced realism, clarity, transparency and immediacy as well as improved imaging and soundstaging in both the lateral and depth perspectives. Phase coherence in the CS2.4 is achieved by utilizing a sophisticated first-order electrical crossover system in conjunction with unusually wide bandwidth drivers. Time coherence is achieved by coincident tweeter/midrange driver mounting and the placement of the drivers on a baffle that is sloped at the correct angle to cause the sound energy from each to reach the listener at the same time. The CS2.4’s 8-inch woofer uses a very low distortion short coil/long gap motor system, powered by a 2.5 pound magnet. The rigid aluminum diaphragm eliminates resonance coloration, a special copper pole sleeve reduces inductance distortion, and a heavy copper ring maintains an ultra-stable magnetic field. In combination with the 7.5 x 11-inch bass radiator, the woofer produces exceptionally clean bass down to 33Hz.